I live in a fairly modern flat in Glasgow’s West End with my flatmate and we’ve been here since September. We’ve actually had the flat since June but both went home over the summer to other jobs. 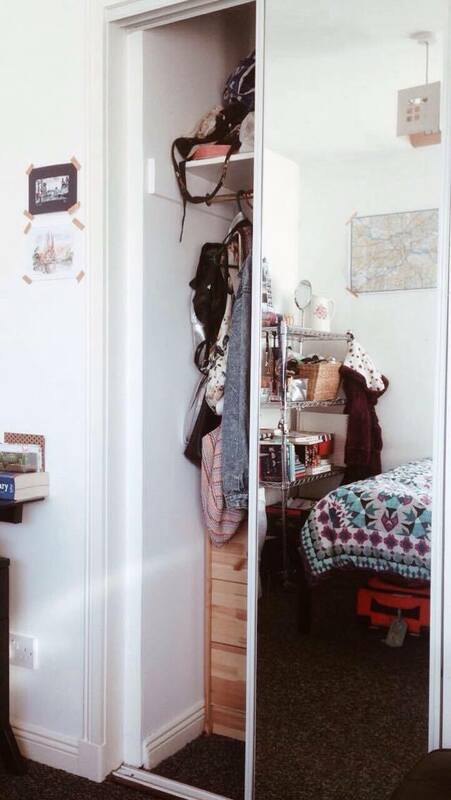 Out of the two bedrooms in the flat, I have the smaller one but I don’t really mind as I’ve since been allowed to convert one of the large cupboards in the flat into a wardrobe for my over-flowing amount of clothes, shoes and bags. Tori is a good egg. Our flat is pretty simple: living room, kitchen, two bedrooms (one en suite, not mine unfortunately, small sob) and a bathroom. WITH A BATH. Which is pretty darn exciting. My bed is a double one (thank the lord) and I rotate two duvet covers from Primark, both brightly coloured. I cannot rate Primark bed sheets enough – they are so well priced, some many lovely designs and very comfortable and soft. Above my bed I have a small collage of photographs from holidays and an array of prints and cards from other people, Paperchase and Ohh Deer. I also have a small framed photograph of my number one honey, my dog Pip. There was a hook left in the wall here after I moved the desk and took the pin board down, so I substituted with this lil egg. I also have my calendar hung up here. Which is jam packed full of motivational quotes so I can look at it and be like, YOU CAN DO THIS. I should look at my calendar more. 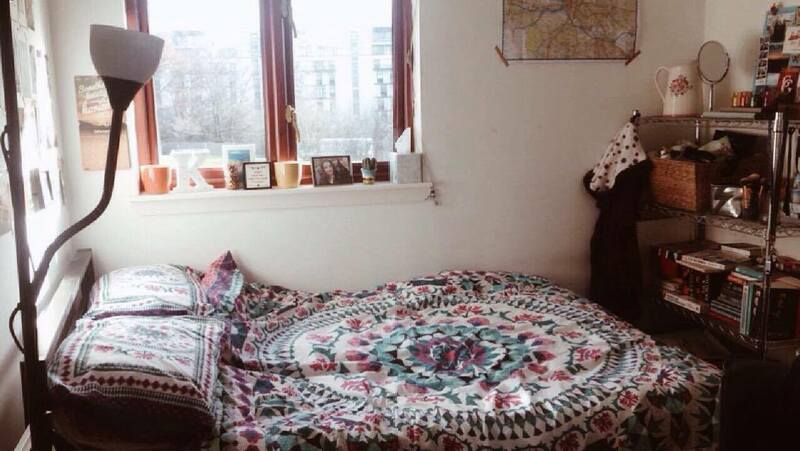 I have no idea where this bed is from but I’m going to assume IKEA or somewhere similar. 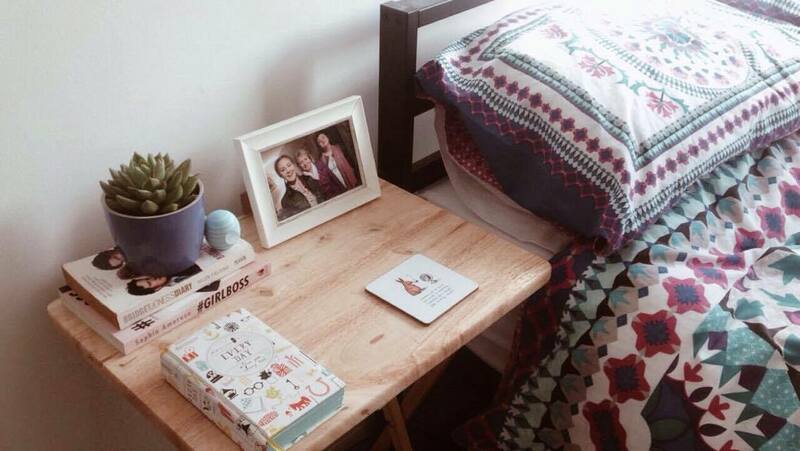 The bedside table however is from B&M Bargains and my mum bought it for me once I moved into halls. 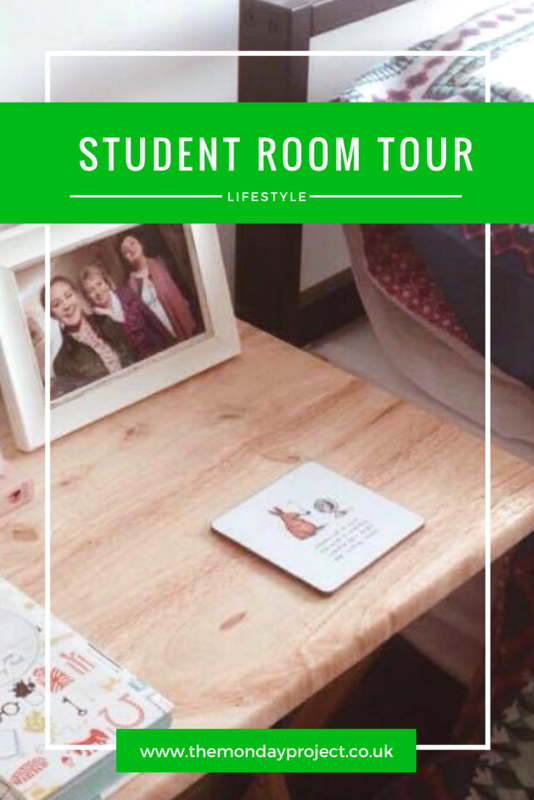 What is it with no bedroom tables in halls? Are we supposed to live like animals? I can’t be the only person who has an incessant need for a bedside table. On a normal day mine is usually covered in half full glasses of water, a dirty plate and some coins as well as the stuff that is supposed to be there. I have my copy of #GIRLBOSS, a succulent, a copy of Bridget Jones’s Diary, a five year memory book (from Waterston’s), a EOS lip balm, a framed picture of my mum, sister and me and a coaster my friend gave me for Christmas. And usually my phone. Only one of the windows in this room opens because it is a dumb window design but what can you do. 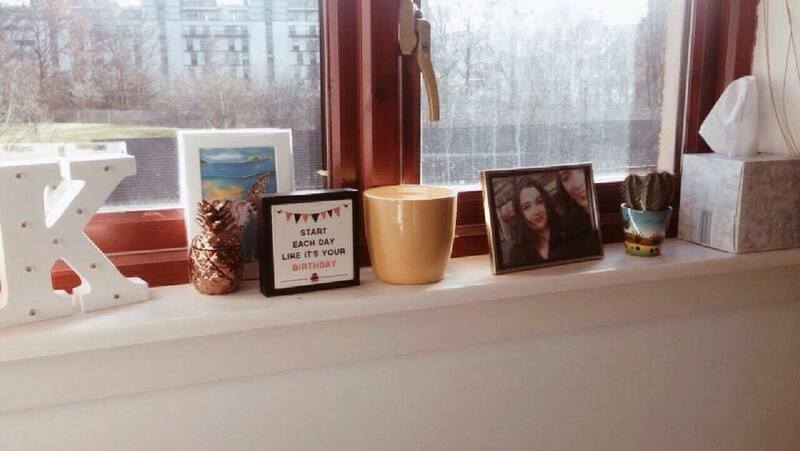 My window sill is adorned with things and I am always wishing it was longer. I have two (empty) plant pots, one containing an old water bottle I use to water my plants. I also have the light-up “K” my mum gave me for Christmas, a print from The Bahamas, a little wooden sign and a framed picture of Emma & I. My first (and still alive) cactus also sits up here next to a box of tissues and also on the window sill is a rose gold pineapple candle from Primark which has featured in almost every flatlay I’ve ever taken. 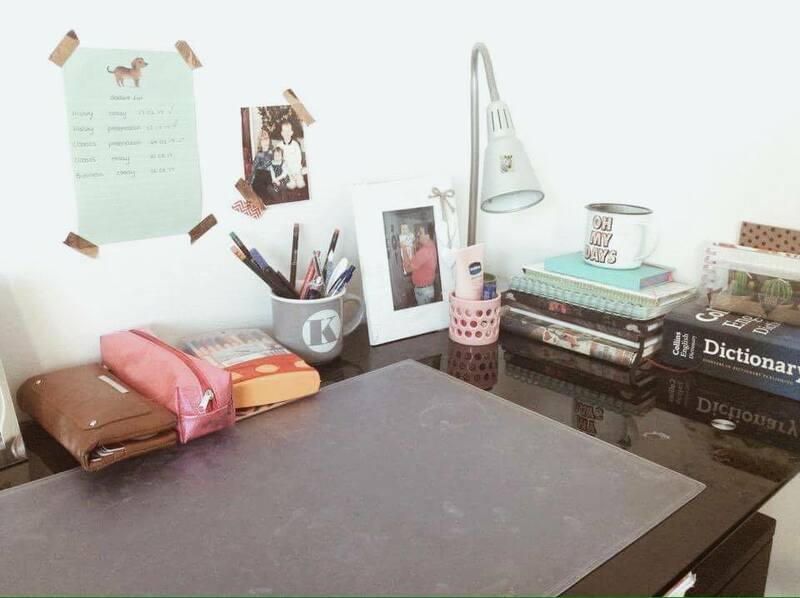 My desk is from IKEA (I think) and I’m quite picky about how it is laid out even though 99.9% of the time it is a tip. I have a dictionary (which I should probably use more), a pad of sticky notes, a candle from Primark, some hand cream, lip balm and a stack of notebooks including my bullet journal and diary at one end. I have a couple of framed pictures: one of me and my dad as a baby and one of Ali & me in Philadelphia. I also tend to stick up a list of uni deadlines and the date they are due onto the wall with washi tape next to a picture of my cousins and I one Christmas. 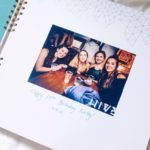 I have a mug full of pens (a classic), a little wooden clipboard which was part of a Papergang delivery and my favourite notebook possibly ever: a little blue with the slogan “Goal Digger” on it. My pin board also sits on my desk and it is covered in Urban Outfitters photo booth strips, photographs, prints, flyers and a “18” heart sign which I got for my birthday. The bookcase is probably the only thing I don’t like as much about this room. Firstly, is it a bookshelf or shelves? It is really big which is great because I HAVE SO MUCH STUFF. 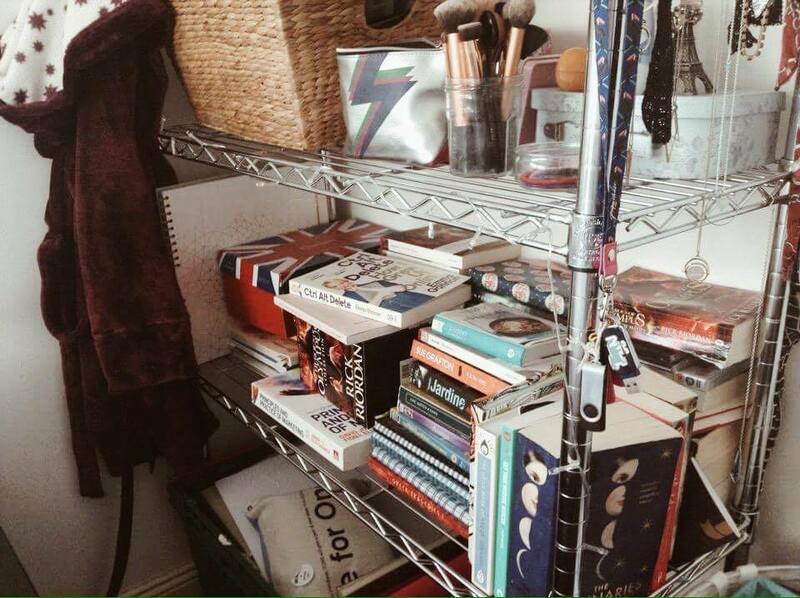 The bottom shelf has a big box full of stationary supplies and university work and I also keep my hair dryer, straighteners and curlers on here. The next one up is all my books. I have books for Classics, some cook books, some DVDs and some of my own books from home. I also have a box of sunglasses and bits of odd jewellery. In a shoebox, may I add. 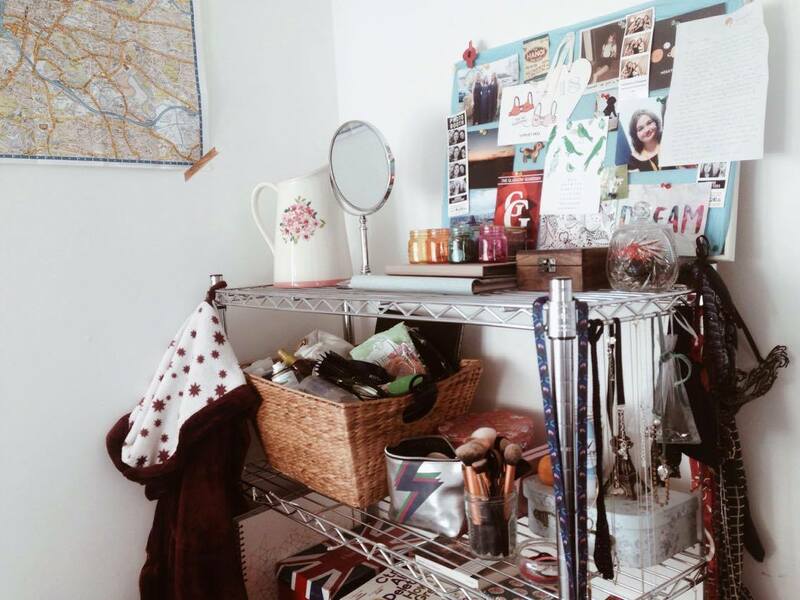 I have a big basket full of toiletries on the next shelf and two boxes full of make-up as well as my make-up bag. The pink box is from TK Maxx and the smaller green one was a birthday present I literally got a million years ago. My make-up bag is filled with the make-up I use most regularly and is from Primark. I have two glass jars of brushes and a small tin filled with things like nail files and tweezers. The top shelf has my two scrapbooks, a box full of jewellery (which is from Tiger), an antique jam jar filled with earrings and a wooden box from Mallorca filled with more jewellery. 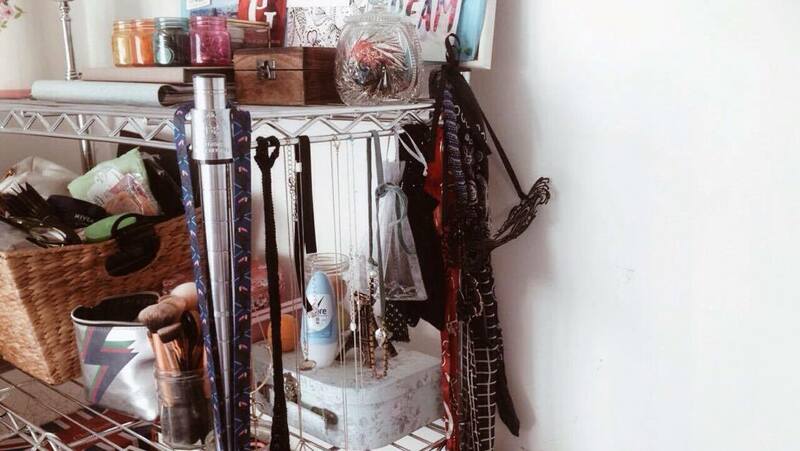 I also hang necklaces from the end of the bookcase. I also have a small mirror up here as well as a succulent and a jug which sometimes has flowers in it. 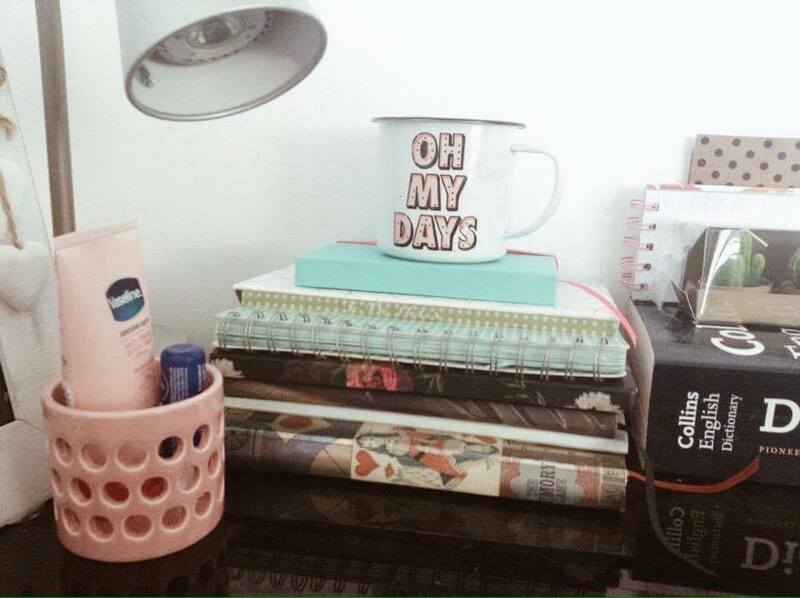 The jug is from Sainsburys and it gives me <3 <3 <3 when I look at it. WHY SO PRETTY. I also hang my dressing gown from here which is a Harry Potter one from Primark. It has a pointed hood like the hats they wear as part of the Hogwarts uniform. It’s very cool. No, you’re the one who needs to grow up. My wardrobe is a built in one with mirror doors which is both a blessing and a curse. Easy to check if I look like a total moron before leaving the house but sad because sometimes I can’t avoid seeing myself in it and I do not want to be reminded I am a heffalump on heffalump feeling days. I keep most of my clothes in the other cupboard so in here I just have longer things which would touch the floor and a chest of drawers (from IKEA) filled with undies, socks and pyjamas. I also keep my towels in here and my blankets. I also have a couple of prints stuck up: one from Barcelona and one from Prague. They are very similar to ones I have in my bedroom at home from Paris and Amsterdam. They are kind of a thing I buy now from city holidays. Like postcards but cuter. There is also a string of fairy lights stuck up here which my mum got me for Christmas. Things I’ve learned: I have a lot of useless crap. I am a loyal customer of Primark, Paperchase, Ohh Deer and Tiger. I should hoover more.